At Frontier Basement Systems we pride ourselves on providing our customers with the best products, practices, and results available anywhere in the industry. Over the years, our patented waterproofing products and exceptional service have earned us many customer testimonials and referrals throughout Tennessee and Kentucky. Frontier Basement Systems is Jackson, Nashville, Clarksville, Bowling Green, Murfreesboro, Owensboro, Utica, Fayetteville, Marion, Philpot, Mcminnville, Franklin, Leitchfield, Shelbyville, Hartford, Antioch, Paducah leading certified basement waterproofer offering Free Estimates on professional services at an affordable price in the area. Since 2002, Frontier Basement Systems has been dedicated to providing our customers with the best service from the first call onward. Our company's service to you does not end the day we complete the installation. At Frontier Basement Systems, we like to follow up a few days after the work is completed to make sure that everything was complete the way it was proposed. The experienced contractors at our company provide professional basement waterproofing services so you can be insured that your basement will stay dry all the time. 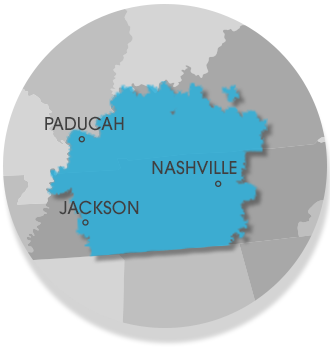 Our licensed contractors service the Tennessee and Kentucky area, including Jackson, Nashville, Clarksville, Owensboro, Murfreesboro, Bowling Green, Philpot, Utica, Fayetteville, Marion, Paducah, Mcminnville, Leitchfield, Franklin, Shelbyville, Antioch, Hartford and nearby areas.